View a slideshow of Vista Lago Adventure Park. Let me just get this out there: I hate heights. That’s mostly because I’m deathly afraid of them, but I feel like I have a right to. This hatred of mine is not altogether unwarranted. I mean, when you’re at a birthday party at a rock-climbing gym, and you get so scared when you reach the top that you can’t move and your dad has to go up and get you, it kind of ruins the adrenaline-boosting experience. This happened to me last week. Just kidding, I was nine, but it was still traumatizing. So when I heard about the Vista Lago Adventure Park at Lopez Lake, I was a little apprehensive. I mean, it sounded really cool. But it also sounded like the thing that I would be really pumped to do, and then at the very last second I would chicken out. I had the same experience with Supreme Scream at Knott’s Berry Farm. I immediately had visions of me frozen with fear at the edge of the zip line, everybody staring and whispering, and someone calling my dad on the phone so that he could come and get me. Of course, he lives about 4-1/2 hours away, so that really wouldn’t be that plausible, but whatever. The point of telling that embarrassing story to a bunch of people I don’t know is that I decided once and for all to rid myself of this debilitating fear of heights. What if I wanted to climb Mt. Everest one day? I mean, I don’t think I will, because I’d probably end up dying but I’d like to know that the option is available to me. It was time for this phobia to hit the road. And what better way to do so than by going to an adventure park with a 40-foot high-speed zip line? So I went to Vista Lago. And that’s how I found myself about 20 feet up in the air, hooked into a safety harness, clambering over tires, ropes, and wooden logs with TLC’s “Waterfalls” blasting out of a loudspeaker. ZIP IT: Vista Lago features four zip lines and four different challenge courses ranging from easy to extremely difficult. As of now, Vista Lago has four zip lines, a lower course (for kids and beginners), and an upper course with varying levels of difficulty. Since I am incredibly out of shape I opted to do the Blue Course, which is the easiest, and end the day’s activities with a quick jump from the zip line. And to be honest, it wasn’t actually as terrible as I had imagined. With the challenge courses—which were very challenging—to focus on, I didn’t really notice the height problem. And when it came to the zip line part, which I was dreading, I was already so pumped full of adrenaline, that I was actually able to enjoy zooming across the park at 35 miles an hour. I’m actually not sure if I fully conquered my fear of heights. But I do know that I had a hell of a time scrambling over the moderately challenging courses listening to the songs of my childhood. So for all of my acrophobic friends who have kept their feet firmly on the ground, I definitely recommend testing your mettle on the courses at Vista Lago. 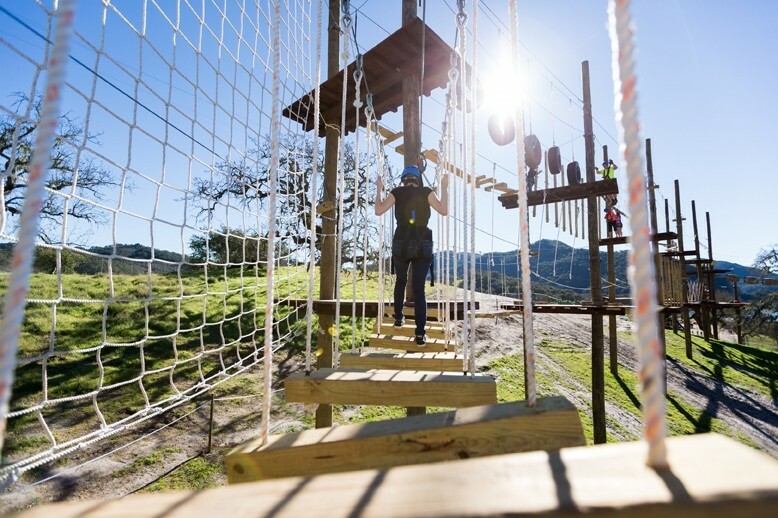 The Vista Lago Adventure Park is at Lopez Lake at 6820 Lopez Dr. Prices range from $12 for the lower course, to $90 to experience the extended upper course and zip lines. For more information about park rates or the various courses, call 710-7970 or visit vistalagoadventurepark.com. The Eagle Athletic Foundation will be holding its seventh annual Hall of Fame Dinner on Jan. 24. The event will run from 6 to 9 p.m. at the South County Regional Center at 800 W. Branch St. in Arroyo Grande. Cocktails begin at 6 p.m., and dinner at 7:30 p.m. Individual tickets cost $50, and a table for eight costs $400. For more information about the event, call the Eagle Athletic Foundation at 474-3200, Ext. 9505, or Foundation President Clarence Cabreros at 710-4654. Intern Adriana Catanzarite believes she can fly. Send your business and nonprofit news to strokes@newtimesslo.com. On Saturday, Jan. 18 a New Times intern and photographer visited Vista Lago Adventure Park in Lopez Lake. Adventure, adrenaline, and ziplining ensued.